Clamps are a versatile part of any tool kit, they can be used to secure a workpiece to a work surface, to secure a straight edge across a work piece for sawing or routing, or to hold a workpiece during gluing. Always use a piece of scrap wood between each jaws of the clamp and the workpiece to prevent damage. When a clamp is positioned, close the jaws until the clamp feels tight, when gluing, some will be squeezed out around the joint, a sign that it is tight enough. Clamping pressure should be applied at right angles to the glue line otherwise slippage may result. Do not overtighten, if the fit is accurate only moderate pressure is required, the purpose of a clamp is only to maintain uniform pressure between the two surfaces, not to force them to fit. Sometimes referred to as 'C-clamps'. Probably the most widely used and versatile clamp. It can be used to clamp a workpiece to a work surface or two parts of a workpiece together. Jaw openings range from about one inch to over 8 inches.. The end of the screw section normally has a swivel head which enables the clamp to sit on irregular surfaces. Metal Hand Screw Clamps (known as 'Toolmaker's clamps') are mainly used in metalwork, however they do have a use to clamp small items. 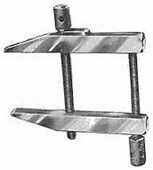 Wooden Hand Screw Clamps are ideal for furniture repairs, the adjustable jaws will also fit angled material. The clamp has a flat bar with a fixed jaw that adjusts with a screw action and a sliding jaw that is locked in positioned along the bar to suit the job being undertaken. 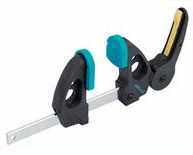 These clamps are for big tasks such as sash windows, table tops, doors etc. Usually several such clamps are required. These are very similar to the Sash cramps but using a round shaft instead of the flat bar. The length is determined by the length of the pipe used, they can be lengthened by adding additional length of tube. 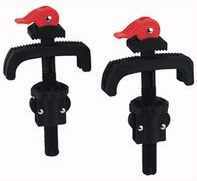 2 piece bench clamp which are designed to fit workbenches with holes 18-38mm. Clamping range 0-80mm. Those shown include quick release clamping action. Ideal for frames. The Nylon band wraps around the object and is tightened with a ratchet. Can be used with (or without) corner gripping pieces (as shown) so that pressure is evenly distributed. Used for gripping two pieces with mitred ends at right angles. Two types are available, internal (upper) or external (lower). 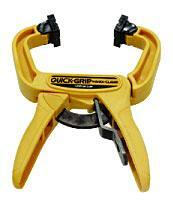 One hand operated clamp (operates like sealant guns) ideal for quickly and easily clamping all kinds of workpieces. Simple single finger release. 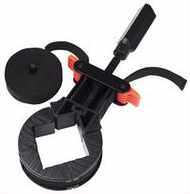 Features one-handed operation with adjustable pressure, best for thin pieces as the jaws do not close square. Exact application of force and maximum power in a single movement. 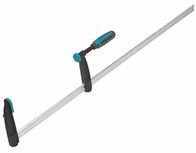 Fast and powerful closing / opening due to special thread and handle grip. A metal bar with serrations. As the clamping pressure is applied the serrations lock & secure the sliding head. Used to hold mitred corners of picture frames. Various designs available, the illustration shows one with a central screw adjustment. 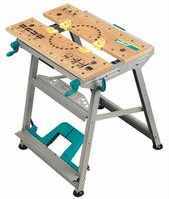 These versatile benches normally include a top which can be used as a vice or clamp. 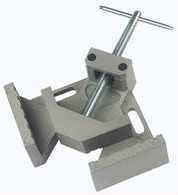 With two independent adjustment handles, the jaws allow for tapered workpieces to be gripped.